The 'point' in the town of Luquillo is protected by reef. 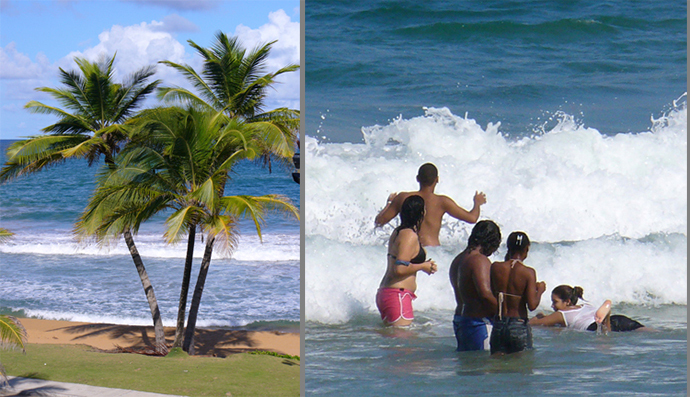 Luquillo's' greatest assets are its' varied, beautiful beaches and its' easy access to San Juan and the rainforest. Luquillo is a small, quiet town. 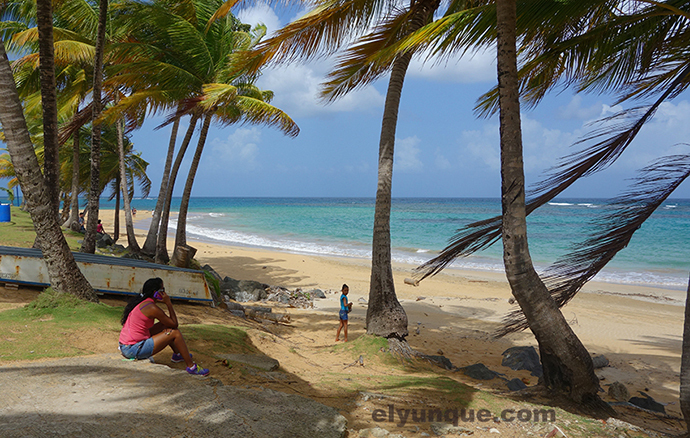 Balneario Monserate (below) in Luquillo is a calm crescent shaped beach lined with coconut trees. Playa Azul beach has a small surf, perfect for body surfing. The 'point' is protected and offers good snorkeling ( in the winter there is too much current) and 'La Pared' offers good surfing waves. (Medium range). 'La Selva' surfers beach is just east of Luquillo. • Sue's Villas above Luquillo, nearby in the foothills of the El Yunque mountains. Nightly and Weekly rental for 2, 4 or 6 people. 2 night minimum. Ideal for nature lovers and great for surfers. Call Sue 787-435-1532. • Yunque Brisas Nice 2 person villa rental is 15 minutes away. On a hill with sea breezes and El Yunque breezes. Cal Brad 787. 646.4196. He is an excellent surfing teacher! • Farmer Market: Every 2nd & 4th Saturday from 8:30 am to 1:30 pm. At the Luquillo Center of Arts & Culture. ( across road #3) Merchants stalls at the Farmer Market sell these & much more: - Veggies (salad mix, kale, carrots, cilantro, parsley, mojito mint & more)- Fruits- Soaps- Crafts- Plants - Cookies, cakes- Ornaments & so much much more. Plenty of FREE parking. The market has a roof, so rain or shine! • 'The Brass Cactus' has varied special nights. Tuesdays half-price appetizers, Wednesday is wine night, and so forth. 'Flamboyan' serves a good breakfast and sandwiches. Lots of 'ex-pats' meet up there mornings. Reasonably priced, on the corner. 'Rincon del Sabor' Pleasant local restaurant, reasonably priced, good food including seafood. rice and beans etc. On the road past the plaza going out of town east. 'LENA'S' on the corner by the plaza. Nice restaurant, a little pricey. 'Pan Rico' Coffee shop, Bakery. Opposite side of Plaza. Breakfast & lunch. Corner - across from the plaza. Great coffee and sandwiches. 'Puerto Rican GYROS' Lunch. at the corner of the western exit of Luquillo.. Interesting food selection. • 'BOARD RIDERS' Surfers Restaurant and local hangout overlooking the ocean. Luquillo is a 'resort' town for locals as well. Popular and fun. there are several more local restaurants around town. • #20 'TERRUNO'. & MUSIC !!! Thurs through Monday nights Renown Jazz saxophone player Charlie Sepulveda on Monday nights. Good food, pick out your own live lobster or mofongo, ribs etc. closed Wednesdays. # 2 'LA PARILLA' seafood and local good cuisine. Tourist - Pricey. #34 'REVOLUTION PIZZA' , terrific pizza! EXCELLENT PIZZA! @ 21 'AY BONITO' Simply Delicious food! • There are 60 options! try any one of them! 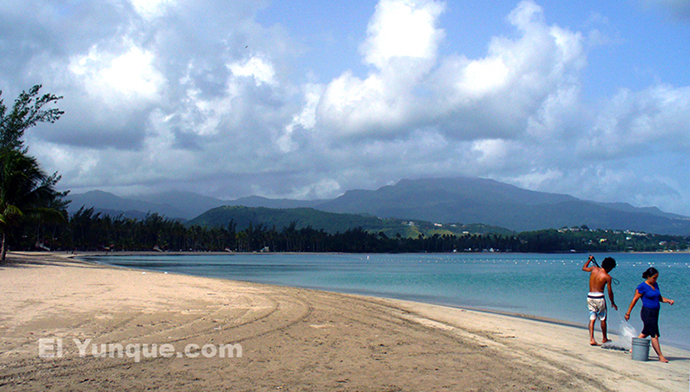 Luquillo, 30 minutes east of San Juan, has a great variety of beaches . . . ranging from the super calm Balneario to 'La Pared' for surfers. There are many short term apartment rentals in the condominiums, especially Playa Azul . . The famous Balneario Luquillo is a fair walk from this plaza. Balneario Luquillo ( public beach) is probably the most famous beach in Puerto Rico, certainly the most visited by tourism. Located about 15 miles or 45 minutes east of San Juan and close to the entrance to the El Yunque rainforest. There are many activities in the nearby Fajardo area also. Biobay kayak trips information. Water Taxi Service to beautiful Icacos Key, white sand and turquoise water. Water Taxi to Icacos. * PLEASE BEWARE: The main beach in the middle of town called 'La Pared' is renown for it's rip tides and can be very very dangerous, unless you have your surfboard attached to you! Someone gets pulled out and drowns every year! All the other beaches are great. Help protect our reefs, use 'rash guards'! Rash guards are the long sleeve tight shirts that surfers wear and they offer the best UV protection. Use waterproof sun block, not sprays.